You will rarely find me inside a Starbucks. I don’t drink coffee and usually my reason for venturing inside one is to do people watching research for my next book. I will, on occasion use Starbucks solely for the purpose of getting a cup to act as Diet Coke camouflage. Sadly, we live in world where entering a meeting with a 44 ounce styrofoam cup filled with chunklet ice, the liquid perfection known as Diet Coke with splash of cherry topped off with a lid and a red straw is considered not only not classy, but unprofessional and brands you as a hater of the environment what with the styrofoam and always gets someone talking about American’s second silent killer, right behind heart disease, death by Diet Coke. To not subject myself to these diatribes I have been known to go into a Starbucks and order a venti hot tea. I then go to my car, dump out the hot water, save the lemon, pour my Diet Coke into the Starbucks cup, throw in the lemon, and presto chango I’m an upstanding member of society and can enter a meeting with an “acceptable” beverage in an acceptable cup. I try to reuse my Starbucks cup as long as I can, but eventually it starts to look shabby necessitating another trip to Starbucks. Is there some Pay It Forward rule book I don’t know about? Did I not get the email about the correct Pay It Forward procedure? As I was thinking about this I look over at the woman who was behind me in line. She’s ordering six coffee drinks, two of them those Double Chocolate Chip Frappuccino milkshake things. I know from the rare occasion when I will buy the drink for my daughter that they cost almost 5 bucks. I had one dollar and change on me. I would need to take out a small loan to pay for that women’s coffee bill. I’m guessing she was doing the caffeine run for her office. 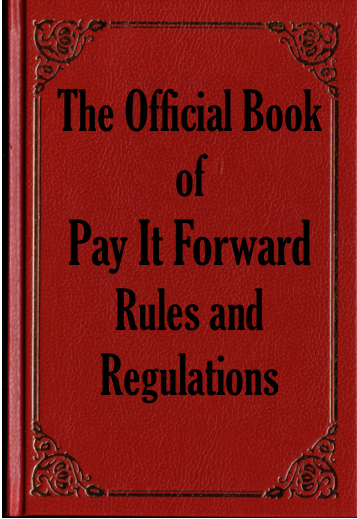 I then look back at the Pay It Forward woman whose hasn’t given up her quest for me to follow her explicit orders. “I want my money back,” she says. Okay, that’s a no brainer. I wish I had thought of that and just given her my one dollar and 3 quarters about 4 minutes ago. “Sure, no problem. Here you go.” I say as I unfurl my hand holding my money and give it to her. Problem solved. I proceed to unlock my car door and open it. She’s still following me. I slid in my car and she peers in and sees my purse on the floorboard. I shake my head, look at her and say, “You know what? I noticed you standing by the Starbucks counter. I’m thinking you waited until somebody ordered the cheapest thing on the menu and then did your whole pay it forward thing. Well, I’m going to pay it forward to you in a big way. I’m going to write about you and your pathological desire to have everyone adhere to your strict paying it forward policy. I then put my car in drive and pull away. She stands there and gives me the evil eye with her hands on her hips as I drive out of the parking lot. My response to that it to turn on my car’s back windshield wiper which is messed up and sprays water not on my windshield but jettisons it into the air. I’m pretty sure she got some wiper fluid on her, that makes me happy. Once I was, what I felt, was a safe distance away. I stopped my car, dumped out the hot water and did the beverage transfer all the while thinking of the things I have to put up with just to enjoy a freaking Diet Coke. You would think I was ingesting liquid heroin. That is what’s wrong with the world – the Diet Coke haters and the rigid Pay it Forwarders. Both groups need to relax and you know the perfect way to do that? Yeah, that’s right by enjoying an icy Diet Coke. I swear. Dear Snarky – Am I a Bad Mom for Not Doing My Kid’s School Project? Revenge by windshield washer fluid- my go-to anger management for the chronic tailgater behind me. I hadn’t thought about the rear windshield washer fluid. Checking into adjusting it now. May the Snark live on. It’s monogrammed tervis tumblers here or you’re considered completely gauche. Good lord but I enter every meeting with a COKE in a LARGE sytrofoam bucket (yeah, not diet, as those will kill you via carcinogen laced sweetener, bless your heart), and a smile. It would not hurt my feelings to die by Diet Coke. Pay It Forward Nutjob obviously needs to watch the movie again…or maybe read a book…or maybe take up a one or two social skills. They sell reusable venti starbucks cups for $1.00. Have you seen those? They have a little bit of insulation, too, so your DC will stay cold awhile longer. The concept of “paying it forward” is rooted in anonymity… Doing a good deed for someone without expecting anything or personal recognition of the good deed. Snarky, you are the Cheetah of the Serengeti of the Suburbs… Take that dim-witted wildebeest down! I’m always amazed (and a little frightened) at how out-of-line “generous” people can get when things don’t go according to their vision. I really don’t think they get that there are differing levels of generosity and forcing someone else to give under duress doesn’t even qualify. I’ve gone completely off topic here… Coke in it’s diet form or otherwise should not have to be apologized for. At least you can’t get cancer from my second hand straw use. Or whatever. I need a Coke. That us the saddest story of pay it forward I have ever read. And as a fellow diet coke drinker and disguiser – and living in California, don’t think I can ever leave the house with my super cute holiday themed styrofoam cups- I feel your pain. I am so sorry you had such a terrible start to your day, I only wish you had flicked a business card I the face of the pay it forward witch when you told her you were going to write about her so she knew where to look for her tale. Best of lick and keep up with the snark. OMG. People need to get over themselves. I get so very very tired of self-righteousness in all of its guises…the breast-feeding police, the environmentalists, the anti-this or thatsers…. I follow the doctrine of “I do what I think is best for my family, and I leave most everyone else alone.” The only folks I don’t leave alone are those that mock others, or treat others rudely. Then, I mess with them. And that woman is just beyond ridiculous. So glad it was you she chose to slather her false generosity all over, because she got what was coming to her. Yeah, that woman has completely missed the point of Pay It Forward. And the thing is, it’s not a hard concept to get. Really, just watch that insurance company ad where one person holds a door open for another and then that person picks up the little kid’s dropped stuffed animal and then that person does something else… THAT’S Pay It Forward. Also known as “doing the right/thoughtful/considerate thing”. What that woman was doing was–I don’t know what that was, besides self-righteous and hypocritical. Good on you for calling her out. Next time toss the hot water on HER! I’m freaking dying here I’m laughing so hard. You rock!